We've got 25% off selected footwear and socks when you buy any full-price footwear! Availability is limited so take advantage today! Get a massive 25% off selected footwear and socks when you buy any of our full-price footwear! To take advantage of this fabulous bargain, simply add any full-price footwear to your basket along with any style from our selected styles and enter the code CFMAY25 when prompted.We will automatically deduct 25% from the price of the selected style. 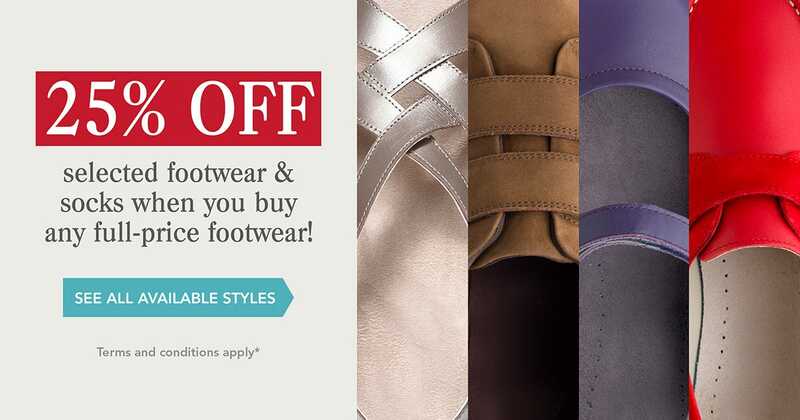 To redeem this offer, add any full-priced footwear to your basket and any item/s from our selected styles. Enter the code CFMAY25 when prompted at the checkout and we will deduct 25% from the price of the item you have chosen from the selected styles. Click here to view the selected styles. Cannot be used in conjunction with any other offer. Offer expires at 11.59pm on Thursday 8th June 2017. Only applies to in-stock items and while stocks last. You may buy more than one of the selected styles within your purchase to qualify for 25% off. If you are returning items for a refund, all items must be returned to qualify. We reserve the right to withdraw this offer at any time.